Hand made pine wood modular wine rack. Manufactured from pine wood. Our stackable modular wine racks are the most versatile and can be easily assembled. No tool is required, takes only 5 minutes. Natural wood color. This configuration is for the 12 bottles wide by 6 shelves high racks, giving you a total storage of 72 bottles. (wine bottles shown in the pictures are not included). Made from Pine wood. See the quality and compare the images. The other sellers are using flimsy thin wood that is not sturdy. Our racks are made with thicker wood, and Wobble-Free Guarantee! with dowel pins to interlock each connection point. 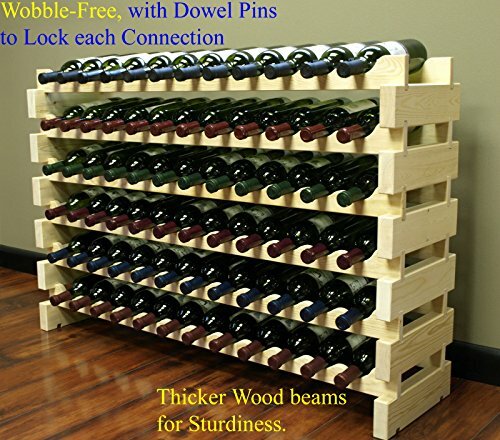 Don't risk your wine other rack by other seller. One fall and you will regret it the rest of your life. . No other makers are providing that feature. Only fit Pinot Noir if you separate each with a Merlot or Cabernet bottle. Made of Pine Wood, it is natural that there a knots on the wood. Measurements: 46.5"WX30"HX11.5"D Assembled. space between each row from the bottom of the scallop cut to the bottom of the row above is 3.6"